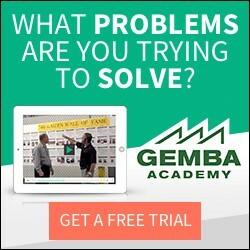 Ask Gemba: World Class Direct to Indirect Labor Ratio? What is considered a world class ratio for direct labor to indirect & salary? In other words total indirect & salary divided by total labor (direct+indirect+salary). I heard .75 to .85 is world class. One would think it would vary quite a bit depending on manual intensive the process was, what degree of engineering and office staff were required to support manufacturing (engineer to order) and so forth. The salary gaps between hourly workers and executive management can also vary greatly from 1:8 or so in Japan to 1:40+ in the USA, for no good reason at that. There are a lot of variables and tricks that can be played with labor cost to change how this ratio looks. Using headcount is not a good measure either since the vast majority of organizations in the world are operating on a misguided notion that bigger teams and fewer levels of supervision (support) is actually better than smaller spans of control, smaller teams, and more layers of support. Read more about that here. I don’t know the answer to this one. Does anyone have an answer to this question? Unless you are measuring two organisations doing exactly the same process the direct indirect labour ratio is of no use except to some accountants who find it necessary to place labour into those two categories because that’s their normal accounting convention. We find that categorising labour into “Volume related” and “None Volume Related” labour is more useful. In some cases we also categorise into three Direct, Indirect and Semi-Direct. It very important however to understand and clearly define which jobs fall into which category and why. In any event if you want to benchmark labour numbers between organisations its no good looking at the end result ratio you need to understand all the data. So in order to do that you must gain an intemate relationship with your benchmarking partners. My opinion is that there are more important ratio’s to measure first like productivity, labour cost, velocity etc. Please leave the direct indirect ratio to the accountants they like counting people. I like the comment of David 🙂 I found a good answer: double the length from one side to the middle! As far as i know, the yearly Harbour Report has good benchmark data in this topic. I would think we need a forensic accountant to answer that question David. I think the Merrill Lynch CEO is on the market. Jon, Above comments about cover it. The measurement is useless other than as an internal measurement and then you need to have a good understanding of the specifics and reason for measuring. For example should a Toyota team leader be direct or indirect? Very helpful comments by all. Ahem. Mr. Moles..
Why would one want to measure direct to indirect? If we are measuring something, it implies that we want to improve it. When it comes to leader-to-led ratios, we should think more about effectiveness than efficiency, which is hard to measure as a ratio. This was a good question as it raised good points and other questions. It may not have been the answer you were looking for B. Huey. If ever we do come across world class benchmarks for this number we will post it here or e-mail you. Lesson for Toyota from the Classics: the Cost of Victory	What Did You Improve Today? If Not, Why?